Seek immediate medical treatment. You or your loved one’s health and welfare are more important than anything. Follow your doctor’s instructions and complete your entire dog bite injury treatment program. Don’t worry about trying to sue the dog’s owner or keeper at this point. It’s very important to get the health care you need after a dog attack. Try to take photographs of the injuries before any medical treatment starts. Many times, the value of a dog bite injury is dependent on the appearance of the initial injuries along with the subsequent scarring or disfigurement that ultimately develops as a result of the attack. File a report about the incident immediately with your local animal control authority or police department. A medical report from the emergency room will most likely not be a sufficient record of the incident. An investigation by the proper authorities can be very important for your legal claim. Call a dog bite lawyer. If the injury is serious in nature (it requires stitches, surgery or a hospital stay), it’s an appropriate time to call an experienced and knowledgeable dog bite attorney. When injuries are serious, the sooner you engage an attorney, the better. The insurance company will be pushing to settle your claim as quickly as possible and for the smallest amount possible. Start a file and keep a journal. Save and record everything associated with your dog bite claim. Keep every medical bill and statement. Write down your thoughts, recollections and feelings about your dog bite case. Also keep track of any income or wages you have lost or forfeited as a result of your dog bite injuries. 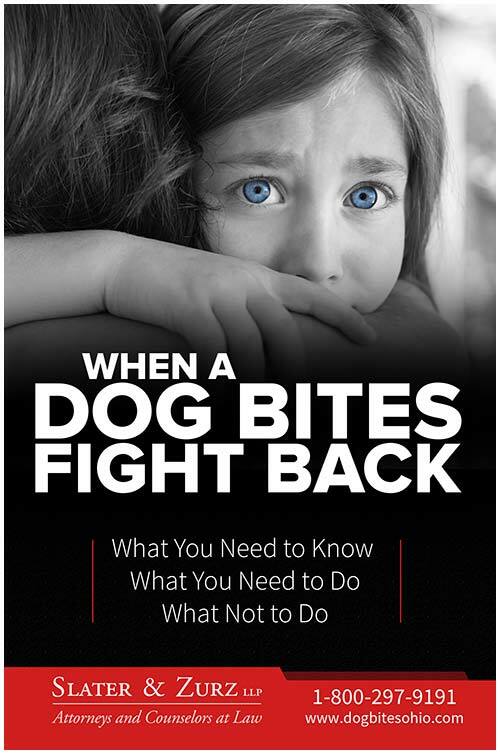 The statute of limitations for a dog bite injury in the State of Ohio is six years. In the case of a minor, the six years begins on the child’s eighteenth birthday. Don’t rush or appear to be eager to settle your dog bite claim as quickly as possible. At a minimum, you should complete your medical treatment. Often times, the extent of injuries and the recovery period for those injuries is not known until well into your medical treatment program. Recovery periods can be extensive, sometimes lasting years.You want to make sure your claim is sufficient to cover the full extent of the injuries and damages for the past, present and the future. Don’t provide any type of oral or written statement to an insurance agent or other representative from the dog owner’s, keeper’s or harborer’s insurance company. If the dog’s owner, harborer or keeper has insurance, the insurance company will almost always attempt to get a written or recorded statement from you. Don’t do this! – the statement will be used against you. There are nearly always minor discrepancies or errors when a person is asked to recall the details of a traumatic event like a dog attack. The insurance company may try to use any inconsistencies against you in order to deny or minimize your claim. You are not legally required to provide a statement to the insurance company and the only reason that a statement is needed by the insurance company is to help them, not you. Don’t sign insurance company forms or medical record release authorizations. For the same reasons listed above for not providing written and oral statements to the insurance company, you should not sign any forms or medical authorization requests from the insurance company. The insurance company is trying to build a case against you by asking you to release confidential records. Don’t help them. Don’t fall into the trap of the insurance agent or other representative from the dog owner’s, keeper’s or harborer’s insurance company. These people may appear friendly, compassionate and look like they want to help you but most of the time they don’t. Their job is to settle a claim for the least possible amount regardless of how extensive your injuries and your damages.A lawyer who is experienced with dog bite injury cases can best deal with insurance companies in order to serve and protect your best interests, not theirs.